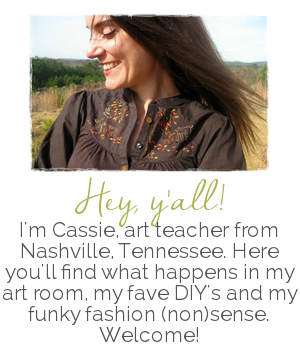 Cassie Stephens: In the Art Room: The Art Rocks Escape Game! 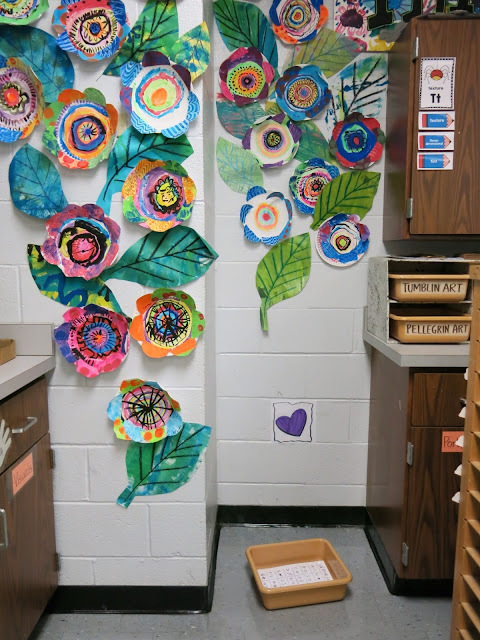 In the Art Room: The Art Rocks Escape Game! Welcome back to school! Over the summer, my husband and I played an Escape Game. If y'all aren't familiar, the concept is that you are "locked" in a room that is filled with clues to help you escape. The clues usually involve code-breaking, riddle-solving and just plain old hide-n-seek. We had so much fun that I decided to bring the concept to the art room. I thought it would be a great way to introduce my kids to the rules, routines and the space that we call the art room. It was such a blast that I thought I'd share it with y'all! A whole lotta (poor) editing went into this bad boy. Apparently I forget to edit the part where I adjust my wig. AND, if you make it all the way to the end of this video, you'll catch a look of how I really felt wearing that too-tight head piece and super-sweaty pleather jacket. Regardless, the kids ATE.IT.UP. Now, if you're worried that the kids will get a lil to wild playing this game, I found a sure-fire trick: Tell them there are SPIES watching. I fibbed to the kids and told them that before class had started, I had pulled aside a couple of kids to be my spies. Their job was to listen and share the secrets they overheard with other teams. Oh my goodness, y'all. Those fourth graders took that so seriously it was bananaz! My only other rule was no running...I have a big room and there was A LOT of excitement. But we can't be running in the art room, y'all. To make things easy for myself, I made all the puzzles identical. Some kids figured out that they were just to look for the yellow heart...but my rule was that all puzzles had to be solved before moving on to the next. My favorite was when one team said, "our puzzle is too hard! "...and I'm all, "Dudes. They are all the same." Once the puzzles were solved, the kids went in search of their heart. I made sure to hide these pretty well so it was a bit like an Easter egg hunt. A dry erase board and marker, a decoder and a code to solve. Each of the seven boxes contained riddles which revealed the class rules. They were to solve the riddle and return to our spot on the floor with their dry erase board. Just in case you'd like to use the code feel free! 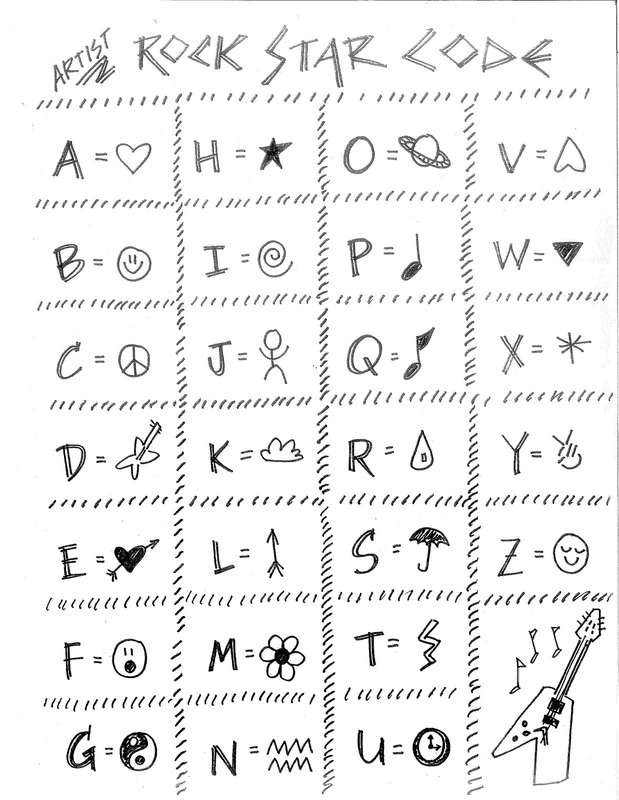 The Rockin' Riddle Rules the kids solved here: have fun, be respectful, follow directions, raise your hand, take pride and be nice. They were highly engaged, that's for sure! Once everyone had their rules, I played the next clip in the video where I chat about each rule. Then we were on to a self-guided room tour complete with a back-stage pass. I tried to think of the places in my art room where the kids would visit the most. I also came up with fun clues to help them find those places. I had specific dry erase marker colors in each spot so they couldn't just write the answers in. Also, I had them go to the places on their pass in the order listed so we wouldn't have any traffic jams. A peek at how I labeled the places and placed the markers. Where we play the Smartest Artist game. After the passes were full, we met again on the floor. In the next part of the video, I take them on a tour explaining the different places in the art room and emergency procedures. The final phase of the game was a "solo mission". Each artist was given three Post-It's and a Sharpie. They could pick from any of the six questions on my board to answer in a complete sentence. Once finished, they returned to the floor where we played a quick round of Smartest Artist before heading out the door. You.Guys. I hadn't had a chance to read what they had written until this morning. It made my day! This was only after a couple of classes had a chance to write. I can't wait to see these filled up! I plan to hang them around the school for our Open House Night. Because my focus is Peace, Love and Kindess this year, this is an important question for my kids. Their responses let me know that they KNOW the answer...we just gotta make it happen. 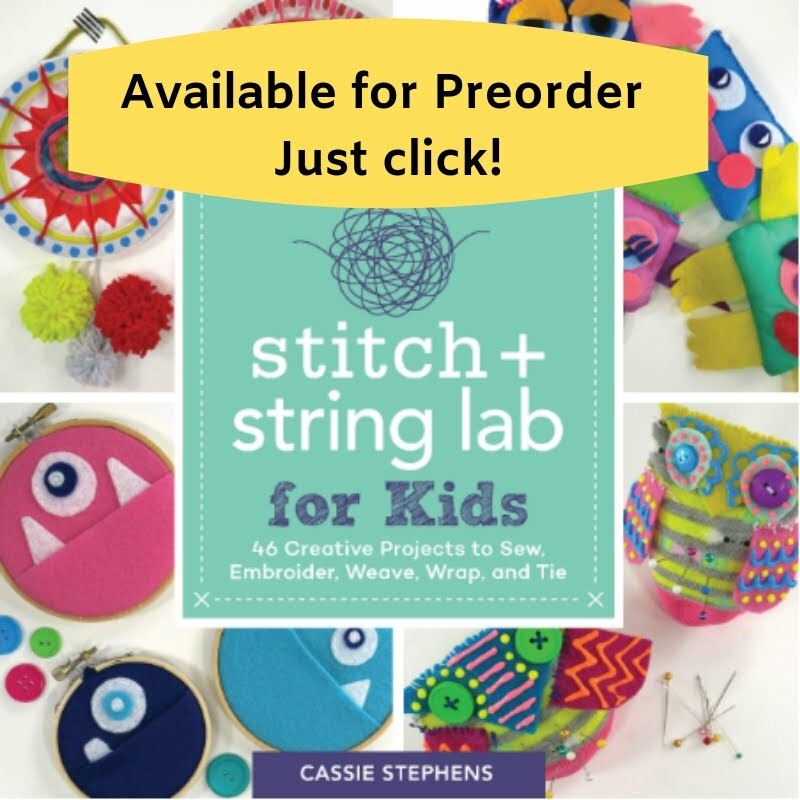 Thank you for allowing me to share this super fun way to kick off the school year! Feel free to steal any ideas you see here. I'd LOVE to know if you do this kind of thing with your students. The kids told me that they are excited to play this kind of game again...which can only mean that this will be a new and fun way to introduce new concepts to the kids. An Elements of Art Escape Game, anyone?! YES, PLEASE! You are too sweet :) I'm a mess is what I am! Hey buddy -- I did this with my 3rd and 4th. I tried to think of a way to make it work with the youngers but they are still so little and I only see them for 30 minutes. So I did show them the clip of the room tour and emergency procedures...and then we got down to art making! Um, I want to know what you eat for breakfast because you seem out of this world amazing. Where do you get your endless energy and creative ideas? I'm inspired so much by this post to refuel for my upcoming year teaching art! Thanks so much! When do you sleep? I can't believe how much work you put into this. Did you do something different withother grade levels? OMG! how fun will that be with you and your sister?! Have a wonderful year and be sure to keep a journal of all the funny things that happen and that the kids say. Y'all will have a great time looking back and reading your passages one day :) Enjoy!! I love your video and your alter ego Mona Lisa. You are too funny!!! You are not afraid to be silly and I love that. My hero. Amazing! 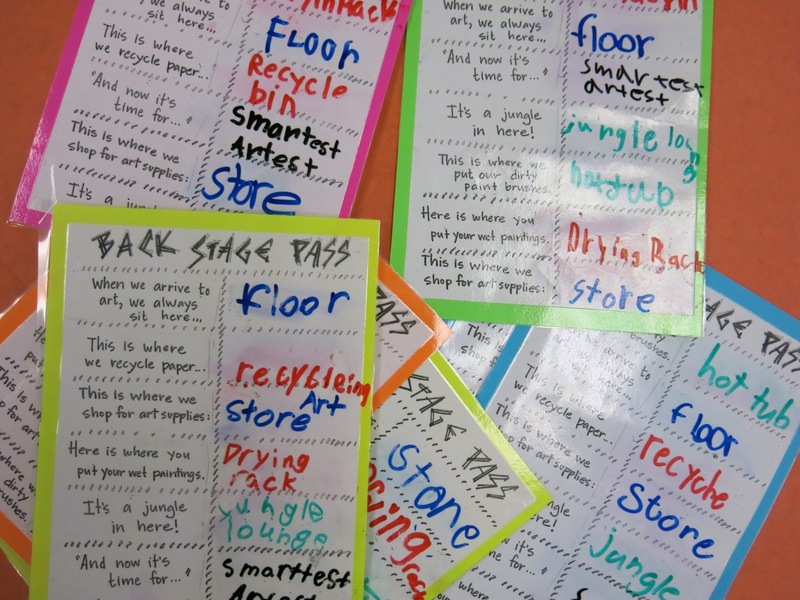 Love, love, love this activity! Fabulous.... you are absolutely amazing! I had the opportunity to meet you in Chicago at the NAEA with your Mondrian dress. We started school last week but I love your plots and schemes, I'm surely going to try the game with 3rd and 4th to see how much information they remember. Have a fun year and keep us inspired. I love this idea! Well, I love all of your ideas! Amazing! I am having trouble getting to the code sheet. Do you have a link? Hope you can help! Have a great year! Thanks! I love this and am now inspired to do something similar with my classes! Thank you for sharing! 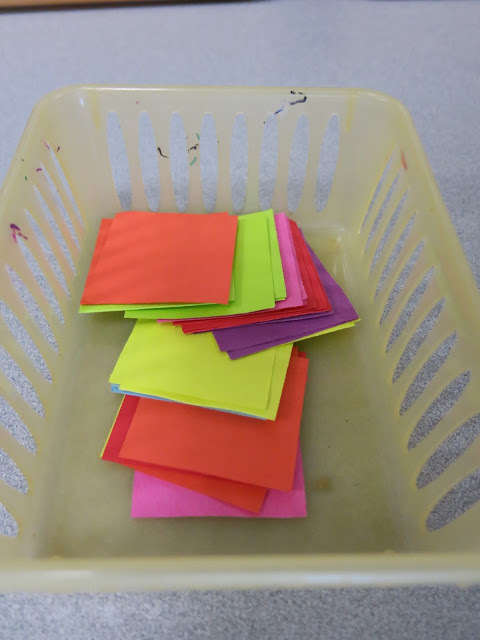 By the way, what were the other questions you used for the post-it responses? 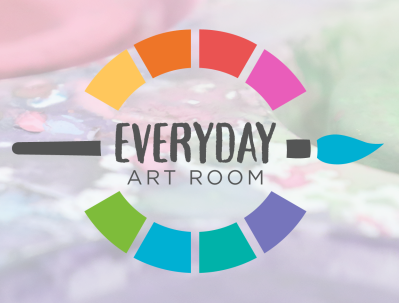 What is your favorite art activity? 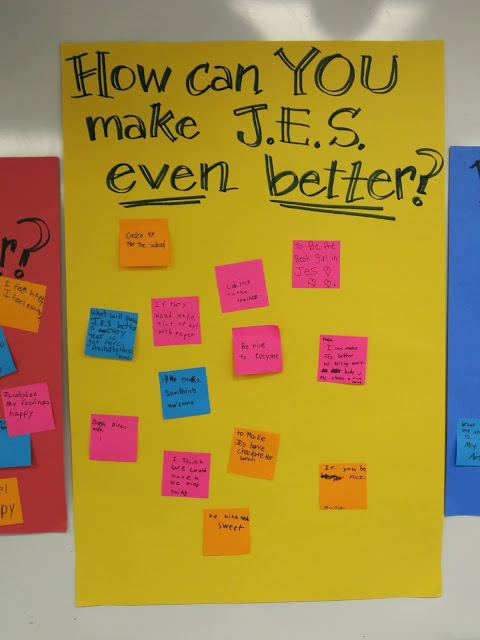 How do you feel about being a J.E.S. Tiger (we are the Johnson Tigers)? How can you make J.E.S. even better? How can you make some one's day brighter? 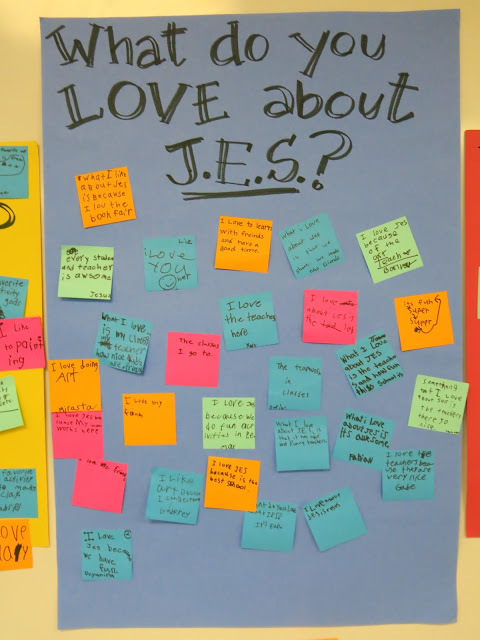 What do you love about J.E.S.? I can't get the link to work for the code/decoder file...is there something that I am doing wrong? I keep getting the message, "The page you're looking for cannot be found." I want the link also please! I would love to do this! Cassie, This is beyond AWESOME! Thanks so much for continuing to inspire and share so much wonderful stuff! I have a question about class times - I just learned that I am going to have to teach all my K - 5 kids in two 30 minute slots in a 5 day rotation vs. one block of 60-75 minutes in a 4 day rotation last year. My classes have always been longer blocks of time, and I am truly panicked about the 30 minute classes. It means I'm going to have to change and/or really tighten up all of my routines, and I have no clue how we're going to get clay projects managed and complete... Feeling very sad and overwhelmed right now. Suggestions, recommendations, previous blog posts - any and all advice would be so appreciated! 1. Like you said, establish some solid hard and fast routines. We walk in quick and quiet. We listen, we get to work, we clean up. BAM! BAM! BAM! The tighter you make that, the more time the kids will have to create. Film your lessons if you need to so that you can speak quickly and not have interruptions. 2. 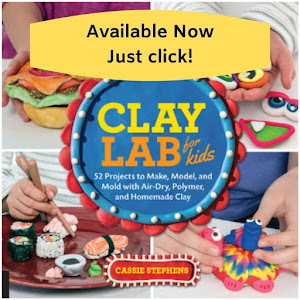 When doing clay, do a Clay Week. Chat with the classroom teachers and admin about changing the schedule for ONE WEEK so that you can have hour long art classes. Invite them in to help...so they can see how you do need that hour. I've done this before and everyone really does a great job pitching in. 3. Get parent volunteers. This is two-fold. Use their help...and allow them to see just how tough your schedule is. They will speak to your admin about the situation...and that could possibly invoke some change. You are so sweet and kind! Thank you for your words, they mean a lot!! So glad the kids had fun! I agree, my babies were def not ready! Cassie!!! Thank you so much for being amazing and sharing your knowledge with all of us. 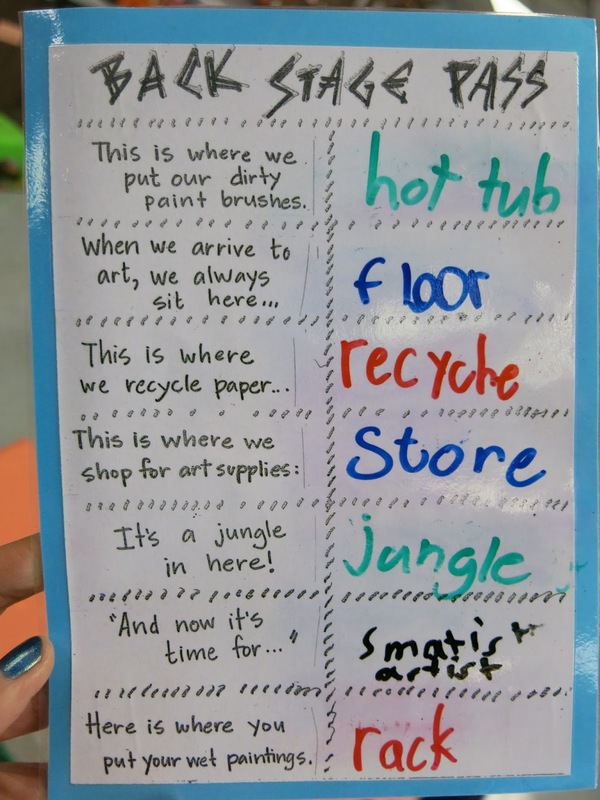 I have adapted your game to fit our school's theme, my art room, and am going to try it out with 2-5 tomorrow morning! I didn't get to make an awesome video like yours, though. Awesome!! Lemme know how it goes and have fun!! LOVED It and I did recreate this for my class and used your video. (You ROCK). Everything was wonderful and I'd do it again. Thank you for sharing! SO AWESOME!! Thank you for sharing! I am excited to use this technique this year with my students on their first day! Our theme this year is rock stars so it fits PERFECTLY! Thank you so much for sharing! This is incredible. I did a video of rules and procedures one year, and it really helped kids stay focused and save me from having to talk so much the first weeks of school. I teach anywhere from 30-32 classes in an 8 day rotation between two schools, so I am always looking for ways to make my life easier and more fun that first week and a half. Also, so jealous of that art room! It's so big and roomy and COLORFUL! Talk about art room goals. Thanks for the inspiration! Now for me to get cracking on some ideas of how to make this happen in my rooms! I was wondering what video maker app or site do you use to record and edit your videos on. I am amazed at all that you do, and love the projects. you truly inspire me even as I approach my 14th year of teaching. Thank you! YOU ROCK!!! You inspire me ! I wish I had viewed this escape video earlier! Loved this idea so much I did a break out game in my classroom to go over rules, where things are located and procedures. Students seem to really enjoy it. Now i didn't have a cool video intro and all but we made it work. I didn't do it with my new students which at our school is 2nd grade, but i did it with my 3-6th graders. Thanks so much for this great idea that allowed me to go over all my rules, not talk my students ears off, and allowed them to have an engaging first day of art class. YOU ARE A ROCKSTAR!! I have read amazing ideas, but your video was beyond fantastic and the planning/format was right on target. My hat is off to you,keep inspiring us & keep that positive energy going!!!! 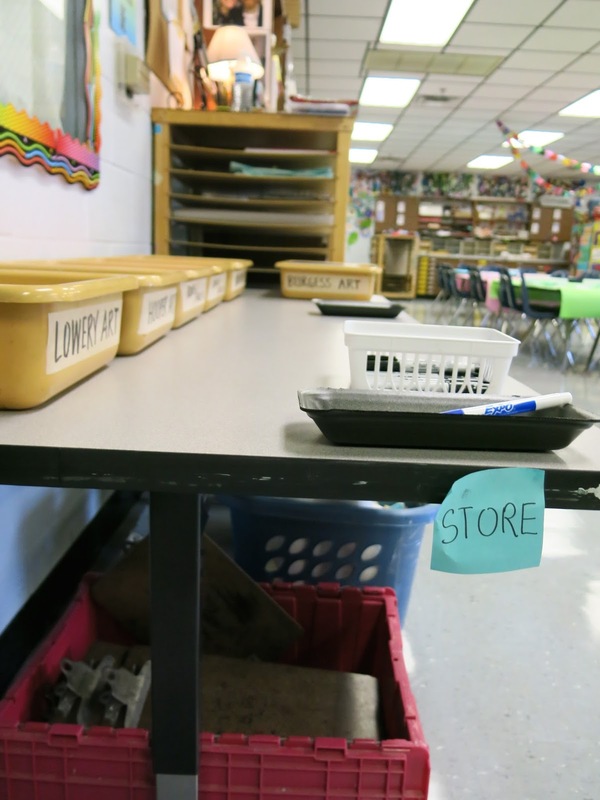 In the Art Room: Art Room Placemats!